After a decade of poetry and free speech, the weekly Monday night Open Mic at The Hideout is closing its doors to spoken word enthusiasts. Thom Woodruff, host at the Hideout open mic for the better part of six years, is reluctant to see the venue closed, but is confident about the state of poetry in the Texas capitol. For many years with an inscrutable diligence and integrity, poets, writers, spoken word artists, musicians and comedians met on Monday evenings from 6 PM to 10 PM and entertained on the front stage in the coffee shop. The best part is it was a free and open service to the public, and quite frequently hosted featured poets and writers from Austin and around the world. So the question is, why after all these years has the decision been made to pull the plug? It seems that management of the theater and coffee shop have decided the open mic is an event not to have, or as it was put to me, “They are tired of the noise, and we’re the noise; they have the money.” And so it goes. It is a shame to see a venue that so competently stood by the poetry and spoken word participants and creators of Austin (and so graciously hosted Virgogray Press readings) shut down. At the same time, those who attended the Monday night open mics will always cherish and remember a staple in the Austin poetry scene. With poetry readings and open mics occurring just about every day of the week, we now have a gaping hole to fill—but one thing for sure is, where there is Thom, there is poetry and an open mic close behind. We encourage all in the Austin area, whether writers, poets or listeners, to make it out to their local open mics, support the scene, support the venue through purchase and raise awareness of these gems of free speech. 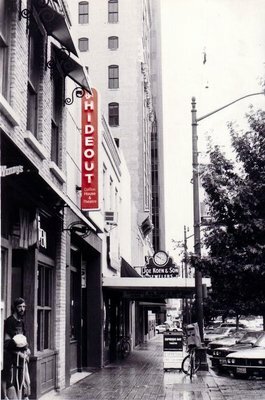 The final open mic to be had at The Hideout will be held on Monday August 29, 2011 and will feature the spoken word talents of Element 615. The event as always is free and open to the public and starts at 6 PM. Bring your poetry, bring yourself, bring your soul and indulge one last time in poetry and verse at The Hideout.